Vegetable Salad with Lettuce, a bright and vibrant salad, that’s perfect for spring or summer. Impress your family and friends by taking your salad game to the next level. Challenge yourself by stepping out of your comfort zone by adding different veggies to your salads that you wouldn’t typically choose. Keep in mind that there are an array of colorful veggies and fruit you can add to liven-up any salad. I love adding different types of veggies and fruit to simple lettuce salads. This gives me the opportunity to get a little creative while introducing my family to more enticing salad recipes. 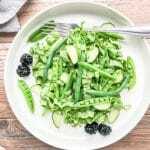 Having a simple healthy green salad, like this Vegetable Salad with Lettuce, is the perfect side dish for when time is of the essence or you’re looking to use veggies that you currently have on hand. It’s quick, easy, versatile, and nutritious. Although there are countless ways to make a vegetable salad with lettuce, I’m sharing with you one of my go-to simple green salad recipes with a few of my favorite veggies. 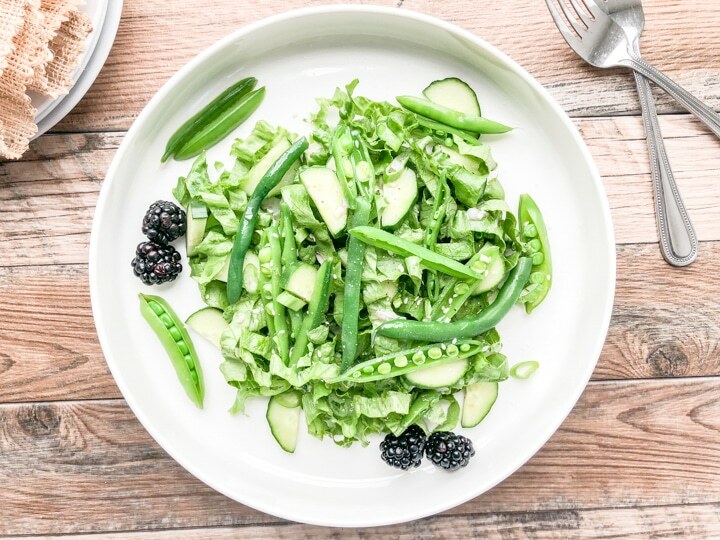 My family loves sugar snap peas, green beans and cucumbers and while I had both of these veggies on hand, I decided to whip up this simple green vegetable salad with lettuce. This salad is simple yet so beautiful and pairs beautifully with a simple vinaigrette salad dressing. Type of Lettuce: Choose your favorite type of lettuce. I used green leaf lettuce although I love romaine and living lettuce too. After you wash your lettuce, please make sure you use a salad spinner to dry your lettuce. It is so worth it. I can’t stand lettuce that hasn’t been drained or dried properly. Cooking Method for Snap Peas & Green Beans: This step is important. So, I blanched the sugar snap peas and greens beans to keep them crisp but to add tenderness. If you’re not familiar with blanching, check it out here. Putting It All Together: Once all your veggies , are prepped and cut, toss all the veggies together. 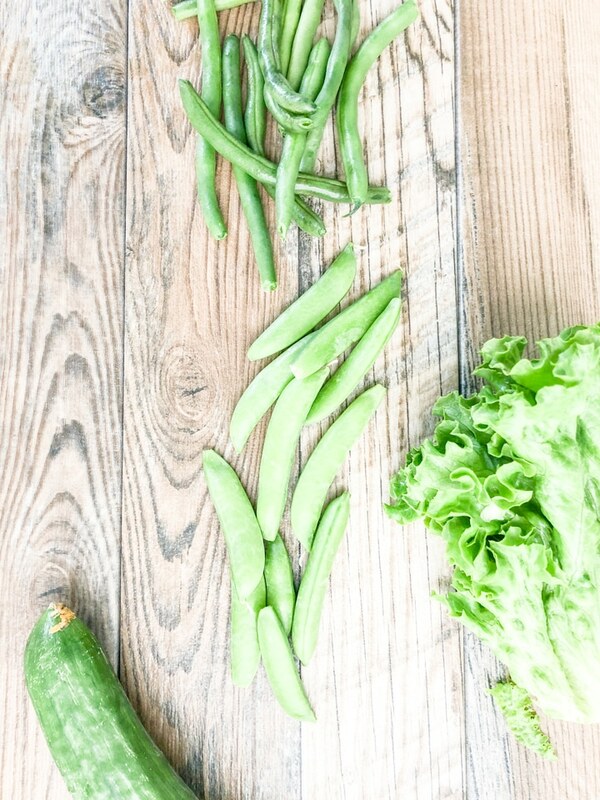 If you’d like to take the extra step, slice some of your sugar snap peas along the side exposing the peas. This, to me, makes the salad look really pretty. Garnish (optional): Feel free to garnish with topping of your choice. I chose to garnish with sliced green onions, sesame seeds and a few plump black berries. Dressing the Salad: I dressed this Vegetable Salad with Lettuce with a simple vinaigrette that consisted of (extra virgin olive oil, rice vinegar, salt, pepper, fresh minced garlic and shallots). Tip – This simple green vegetable salad with lettuce is a perfect side dish to accompany spicy or hot food. The addition of the cucumber has the tendency to refresh and cool down the palette before taking your next bite of spicy hot food. 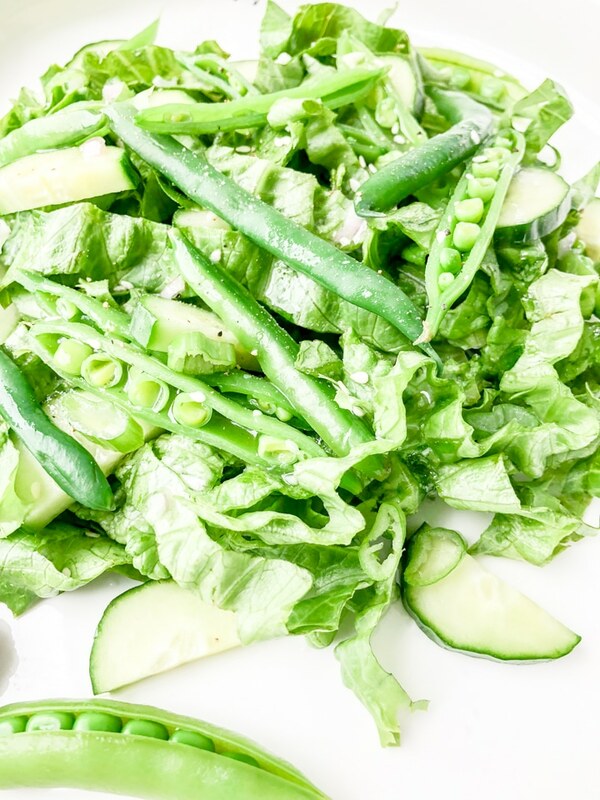 Vegetable Salad with Lettuce - This beautiful green simple salad is made with fresh sugar snap peas, green beans, English cucumber and dressed in a simple vinaigrette. This is the perfect Spring or Summer salad to serve to your family and friends. Simple salads do not have to be boring. Challenge yourself to take your salad game to the next level by adding other varieties of veggies. Wash, drain, and dry lettuce using salad spinner. Chop lettuce. Set aside. Prepare an ice bath, by placing ice in a medium to large bowl and add water until half way full. Set aside. When water starts to boil, add sugar snap beans and green beans to boiling water for 2 to 3 minutes or until tender. DO NOT OVERCOOK. The veggies should still be crisp, vibrant green but tender. Remove from heat and place in ice bath to stop the cooking process. Remove veggies from ice bath and place on a clean dish towel or paper towels and blot dry. In a salad bowl, add chopped lettuce and remaining veggies. Season to your taste with salt and pepper and toss. Garish and lightly dress salad with simple vinaigrette.